Hi, The Flash fans! Are you in the mood for some EMOTIONS? I sure hope so, because this episode is packed full of them. Sadness! Hope! Loss! Triumph! Love! Fear! They’ve got it all, and it’s marvelous. When I first watched the episode, it seemed like the Speed Force was scattered in its mission for Barry. I chalked it up to vague writing for a vague entity, but mostly ignored it because the emotional beats for Barry’s plot in the Speed Force hit really well and it’s virtually impossible for people to succeed at the “ineffable, mystic source of wisdom” television moments. Everything might have seemed messy, but it was a forgivable kind of messy — a kind of messy that wouldn’t overwhelm the good with the bad. However, when I re-watched the episode in preparation for this review, I realized that the Speed Force was actually providing a well-paced, perfectly understandable arc for Barry. One that was actually critical for his future as the Flash, and one that makes Barry’s seemingly halfhearted, gloomy role as a hero this season come full-circle. The Speed Force welcomes Barry by placing him in a recognizable surrounding (Barry’s childhood home after his mother’s murder) and giving itself a recognizable face (Joe West’s). It explains that it’s not so much a “force” like gravity or light, but a being within that force. The Speed Force tells Barry to have a seat, and explains that Barry isn’t going back home until he catches what appears to be the only other creature in that manufactured world: a vaguely human-shaped blur. When the Speed Force takes the form of Iris, she tells Barry, “You were given a rare and precious gift, and you rejected it.” Barry (understandably) assumes she’s talking about when he gave up his powers in order to save Wally, but she’s not. Figuring out what she really means is part of the journey Barry has to complete before he can go home. Cisco manages to get through to Barry and offer a trip back home, but the Speed Force informs him that going at that time means going home without his powers. Barry turns away, because he knows that he’s not truly ready to stop being what the Speed Force made him. It’s when Barry arrives at a cemetery, with the third incarnation of the Speed Force (taking the form of Barry’s dad) that things start to really develop. The Speed Force questions Barry about his feelings over not being able to save his mother, and Barry’s still rankled by the implication that he rejected his powers, considering all that he’s sacrificed for the sake of them. What does one thing (Barry’s powers) have to do with the other (his mother’s death), though? 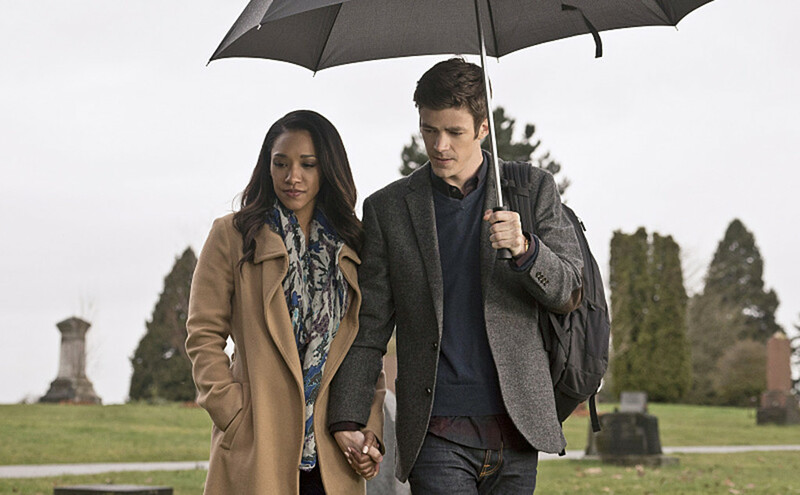 Barry’s role as the Flash in inextricably linked with the loss of his mother. He wanted to use his powers to solve the mystery of her death and then he wanted to use his powers to stop her death from happening at all. In some respect, saving people around Central City was secondary to Barry’s mission to understand the death of Nora Allen all throughout season one. Since that mystery has been solved and the choices Barry made regarding saving her are pretty set in stone, I don’t doubt that (on a subconscious level) Barry thinks of his powers less as a “great gift” and more as a tool, incapable of doing the job he’d wanted it to do. That’s the “rejection” the Speed Force is talking about — Barry’s inability to see his powers as a gift, rather than a means to a now-defunct end. The mission of the Speed Force is to show Barry that he can exist as a hero in his own right, without his sense of loss propelling him forward and giving him a reason to fight. He can disentangle his regrets, his pain, and his past from his role as the Flash and become the hero he’s always meant to be, one fully attuned with the Speed Force and whatever living, mysterious, ever-present entities reside within it. After reading from a children’s book he remembers his mom reading to him — “The Runaway Dinosaur” earning itself the most emotional of title drops — and finally catching the blur (who is, of course, Barry-as-the-Flash) Barry can finally let go of his past and embrace his future. Wonderfully, Barry’s future takes the form of Iris West, reaching out through the Speed Force via Cisco’s Vibe abilities. He takes her hand, and finally goes home. While Barry has been having an existential chat with the enigmatic entity responsible for his super powers, the rest of Team Flash has been trying to figure out how to get him home and dealing with the aftermath of the second particle accelerator explosion. To summarize: Wally and Jesse were both hit by the blast, and while Wally wakes up immediately and seems fine, Jesse is found unconscious and her heart has stopped beating — only to begin again when Harry basically shouts her back to life. Hey, maybe that's why Tom Cavanagh whispers all his lines as Harrison Wells? Apparently when Wells raises his voice, the dead rise. And speaking of the dead rising: zombies! Or, well, one zombie named Tony (a.k.a. Girder), whom long-term The Flash fans might remember as that guy who used to bully Barry for his mom being dead. Girder still has his metahuman abilities despite being undead and he has something of a fixation for Iris. You know, generally I wouldn’t enjoy a metahuman-of-the-week plot when so much big, epic character stuff is going in the other half of the episode, but the Team Flash crew is so fantastic in “The Runaway Dinosaur” that I don’t even mind. But you know who didn’t bug me? Iris. Iris was amazing. While trying to figure out how to stop Tony’s rampage through Central City, Iris figures out what he’s really after: her. Iris is brilliantly more excited about figuring out the method to Tony's madness than she is scared about the metallic zombie’s fixation on her. She even offers herself up as bait, just like that, and — in another bit of loveliness — Joe's disapproval of her plan is limited to a shake of his head and some noises of complaint. Iris isn't forced into protection, nor is her autonomy and the ability to make her own decisions undercut by her father. Or anyone. Joe goes along with her to wait for Tony's arrival at the West household, but he doesn't coddle her or pretend like she's not perfectly capable of taking care of herself. I don't doubt that there's some level of comfort in the knowledge that Tony targeting Iris isn't about hurting her, but because he had a crush on her before he died. still, the fact that Joe doesn't "put his foot down" in protest of Iris's involvement and even works as her backup is incredibly refreshing. I feel like the treatment of Iris's character in this episode might be indicative of her future as Barry's equal partner. While Iris lacks the techy know-how that Team Flash has relied upon since Barry started being the Flash, "The Runaway Dinosaur" proves her to be strategically intelligent, brave, and capable on her own. She also works well with the rest of the team — especially Cisco, and I was surprised at how charming the two were together throughout — in a way I don’t think we’ve really seen before. Furthermore, she cements her role as Barry's emotional tether — the "voice that brings him home" — and this episode put a lot of emphasis on Barry's need to be both mentally and emotionally connected to his life as the Flash and his life as Barry Allen. Iris helps him do that. She's a shoulder to lean on and a person to talk to, someone who understands loss and loneliness as much as she understands the need to be better, to be the force of good in the world and fight back against evil. After Iris pulls Barry back from the Speed Force, she’s dealing with a man changed for the better. Barry seems rejuvenated by his experiences and wiser than he’d been when he’d left. Also, he wakes Jesse out of her coma with a bit of Speed Force spark, which... uh, so are we going to get another speedster on the team, or what? Because the show still needs to set up the last two episodes, the ending isn’t a happy, joyous occasion revolving around Barry’s return and how he embraces his new direct-from-the-Speed Force powers. It’s a tag starring Hunter Zolomon/Zoom and captive Caitlin Snow. Zolomon gives Caitlin a choice to stick around and join him, or leave and join — and die — with her friends. Once that's delivered, he puts on his mask and does a rousing speech, like all evil dictators are wont to do. Except, Zoom's speech is to a bunch of metahuman villains chanting "Our world!" and it is the most terrifically comic book thing I can recall ever seeing on TV and I love it to pieces. This show is the best. Yeah, I downplayed the fact that Kevin Smith directed this episode by... not mentioning it at all in the review proper. It’s a big deal, though! Something really great about the embodiment of the Speed Force talking to Barry is that, despite the fact that it's played by a different actor each time, they do manage to make it seem like a consistent character that is very unlike the characters these actors play regularly. "Fake Wells might have done a few dissections for study purposes." "This didn't tip any of you off that he might be secretly evil?" Just, everything from all the Iris/Cisco interaction was the best. "Get behind me." "You get behind me!" THE BEST. Zombie Tony sees his reflection in one of the morgue lamps and freaks out. Yeah, I have days like that too, bro. Um, wasn't Tony killed a long time ago? Clean out your storage rooms, S.T.A.R. Labs! Grant Gustin's delivery of the lines from the book was so perfect. There were no tears or anything, but it still managed to be so heartbreaking. "I am so glad you're back, because we're about to die." "Wait, what?" Cisco and Harry had a great dynamic in this episode, too. I think half the antagonism Harry has toward Cisco comes from how alike those two secretly are. Like, I'm willing to bet that Young Harrison Wells was just as hyperactively genius as Cisco is, but time and mistakes beat him down into a grump. Let's hope that doesn't happen to Cisco.